This is another caliper option that should not require either drilling the piston bores or a manifold. need to drill the mounting holes to fit the bolts. Please verify for yourself and use at your own risk. I'd like to add one piece of information that will save some work for people doing this conversion. (please don't shoot me if this has already been mentioned in a post and I missed it) The volvo calipers that you really want to use are those found on a 1992 240 with abs. These calipers only have a single brake line and do not need the adapter manifold or the drill mod. ​I received this info from a customer(Thank you Gary Y! He used the '92 240 calipers as mentioned above. This is what he used for the brake hose to connect the caliper. Both can found on Summit Racing's website. input), or some fancy plumbing. These calipers are popular upgrades for a variety of vehicles out there besides the Datsun Roadster, so you should be able to find even more info by searching the web. Just keep in mind that a lot of the other mods out there are using a non-vented rotor, so even though the calipers look the same, they are too narrow to fit the vented rotor. These calipers have two separate brake circuits in them. In their stock usage, they have two brake lines running to them. 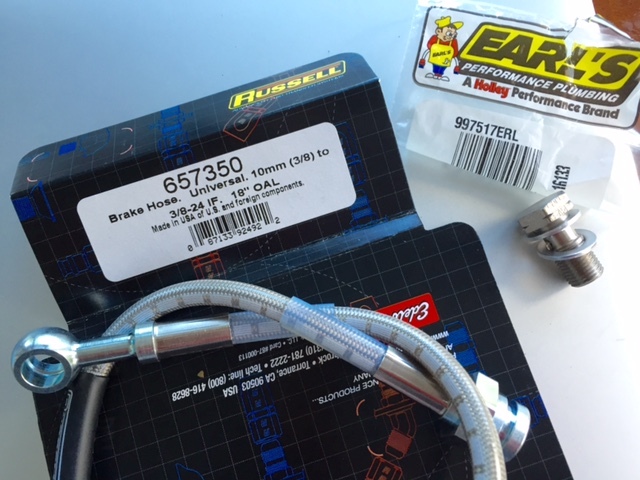 There are two common options used for connecting them to a single brake line. One is a caliper manifold and the other is to disassemble the caliper and drill a connecting passage between the pistons. The caliper manifold is available from Breck Myers. Here's a copy of an email from Breck for an idea about pricing. I do still make the Volvo Caliper manifolds and it would cost $100.00 US for the 2 manifolds and banjo bolts, crush washers plus 3 day priority mail shipping in the U.S. If you don't need the banjo bolts and crush washers, the total would be $60. I'm waiting to hear how soon the machine shop will have the next batch of manifolds done, and I'm hoping they can machine them within the next couple of weeks. Let me know if your still interested and I'll give you my Paypal info for sending the payment. It has been noted by previous users of the Volvo calipers that the surface around the brake line mounting holes is not always machined. There seems to be no way to insure getting ones with the machined surface. Some have clamped the manifold on with the copper crush washers and it's been okay. You may want to get your calipers first if you think this will sway your decision about how to connect your brake lines.